Office and warehouse Tenants should remember they are the Customers of Landlords, deserving good and fair service! How do I measure my office size needs? To estimate your office size requirements, a good rule of thumb is 200 square feet for each person in the office. This number INCLUDES the affect of hallways, conference rooms, reception areas, storage rooms, and break rooms. The interior layouts of spaces vary in their efficiency too. Our goal is to get you in the least amount of space that gets the job done at a great price with flexibility for potential growth. Can I get a one year or six month lease? Yes, Landlords will sometimes offer them as options. However, you should expect to be paying a premium above the asking rent along with needing to take the space "as-is". Landlords also use it as a tool to increase the rents after your short term, since they know your cost to relocate makes tenants less likely to move again. What will it cost upfront to lease a space? Expect to pay one months rent, plus a refundable security deposit equal to a months rent. In addition, you will need to buy a liability insurance policy and pay for the connecting of your data and phone service. Additional costs needed may be your own suite security system and of course furniture and supplies you bring. Are there many vacant spaces to choose from? Yes. 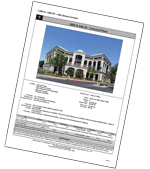 There are more than 18,000 commercial buildings across the metro phoenix area and they average about 15% vacancy.. After you provide us with a description of what you want in terms of space we will send you an up to date sequential detailed report listing all the options matching your requirements. The current market data we send you is provided thru nationally owned data bases which brokers pay a subscription for, similar to a residential MLS service. What is the difference between NNN, Full Service, Modified Gross rent quotes? There is a huge difference. Full service means the landlord pays all expenses. NNN means the tenant pays all expenses. The expenses can run between $6 and $8 per foot per year! A modified Gross (or industrial gross as used in warehouse quotes) means landlord pays the property taxes, and tenant pays the other expenses. How does the Tenants agent (ProStar Realty) get paid? We get a split of the commission already being paid to the Landlords Agent. Landlords have agents to represent their interests and pay them a healthy commission. When Prostar Realty represents the Tenant, the commission is split, between Landlords agent and Tenants agent (ProStar Realty). Landlords get the commission they're paying from the rent you'll be paying! You're at a big disadvantage if you don't use a Tenants agent. Are there any costs or obligations for Tenants agent representation? No. We don't ask you to sign any agreements with us or advance any money. We will work hard for your business and to keep your business. We help you through the search process, the lease negotiation process, the lease documentation process, the remodeling/reconditioning process if needed, and through your final occupancy. And we stay available to you as a resource if issues arise where we can help. What parts of a lease deal are negotiable? All parts; including rent, free rent, who pays for improvements, length of lease, increases in rent, relocation clauses, guarantee clauses, signage, repairs that may be needed, security deposits, hours of services, parking costs, insurance coverages, early termination clauses, renewal options, expansion language, expense increases. Who pays for any improvements or changes to the space? Typically the landlord will pay to move walls to match your exact needs and freshen the office space with new carpet and paint. Custom modifications above the normal may be passed on to the tenants by increasing the monthly rent over the lease term. Warehouse space is usually delivered in a broom clean condition with all systems working. What is the average lease length? Average leases are 36 months or longer. This gives the landlord a sense of predictability they need to both value their property higher and present favorably to a banker if they need to finance or decide to sell. With a 36 month or longer lease, landlords will typically prepare the space in top condition for you. Some leases are 5 to 10 years. Shorter terms are done too. How do I estimate the monthly cost of the rent quotes? In the metro Phoenix area, rental rates for office and retail type properties are stated per foot per YEAR. To estimate the monthly cost of an office space quoted per year, simply multiply the space size by the rental rate and divide by 12. Industrial and warehouse property usually quote rates per foot per MONTH. Don't forget to include or exclude NNN, FS, or MG/IG when comparing options. Do Tenants need to sign a personal guarantee of the lease? Not necessarily. Guarantees are asked for by almost all landlords. In our view, it may be reasonable to provide a guarantee to a landlord if they are fronting serious money (e.g. above standard tenant improvements) to entice you to lease the space. Landlords risk for any real financial loss is very low, as they have the right to quickly evict tenants if they don't pay and can lease the space the next day to someone else. How much are parking costs in office buildings? Many office buildings provide open free spaces on the surface lots for both employees and visitors. Those with parking structures or offering covered parking will charge. A $35 per month charge for a covered parking space is the equivalent of adding $2 per foot per year to the rent, based on each employee occupying 200 square feet of space. Also consider that buildings with parking structures often require visitor's to pay too, usually leaving a bad taste when they leave your office. Why is the Landlord and Manager so important? The manager is the person you will be dealing with throughout your lease term. This is most often NOT the friendly leasing agents you meet before you occupy the space. The manager should be professionally knowledgeable, fair and attentive to the tenants needs. Also you may want to find out how solid the Landlord's finances are and where they are located. A good method is to ask current tenants about their experience in the property as you visit. Why are lease documents so lengthy? Your lease document is the document everyone relies on when there is difficulty in a relationship. A thorough document is typically from 15 to 25 pages. The extensive details are set out to be understood by the parties, which is better than a short document which may leave issues unclear. If you don't understand it now, it won't get any clearer in a heated dispute. We will help you review the document for red flags and issues you may want to address, plus we always recommend you have both legal and tax advice before signing any final commitment. Who arranges the data lines in the office or warehouse I lease? This is almost always the Tenants responsibility. Contact Centurylink and Cox to get the exact broadband and internal data wiring capabilities and pricing in the building by providing the address of the location you are considering. They may ask you for the specific suite number.